All Spirit of the Hills members in good standing are encouraged to share your arts related news events here on our website and through our email newsletters. To add your event to both, please fill out the form on the bottom of this page. Thanks. Patricia Calder will be participating in this year’s SPARK Photo Festival. 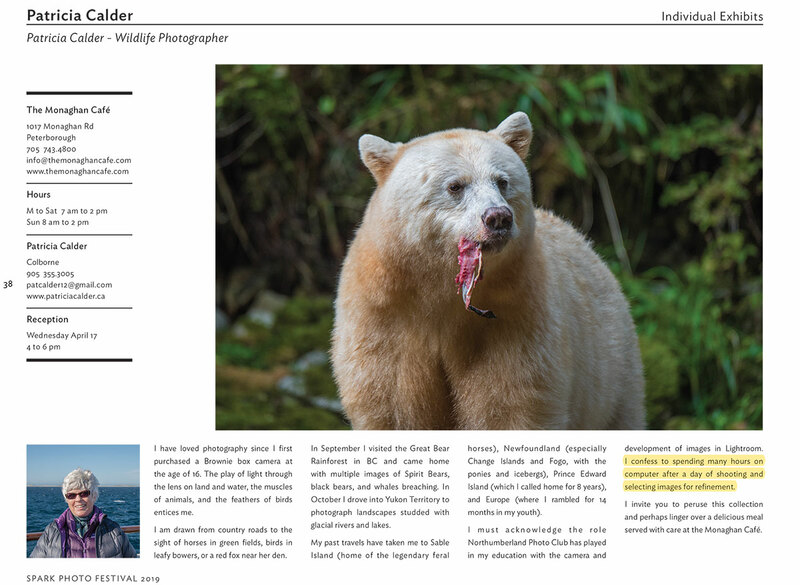 All through April (and May) my photography will be on display, featuring bears, whales, horses, and bluebirds. A reception will be held on Apr. 17 from 4 pm to 6 pm. All are welcome. Monaghan Café is open every day except Mon., 7 am – 3 pm for breakfast and lunch. I will be there at noon on Wednesdays during April to answer questions. The reception is Apr. 17, 4-6 pm. Lori Felix has an exhibit at the Sarah Jane Williams Heritage Centre in Bowmanville in conjunction with Soper Creek Wildlife Rescue’s Wild Ontario exhibit. The show runs until May 5th. Lori donated one piece for auction and is giving 50% of all proceeds to Soper Creek in order to raise funds for their medical building. Spirit of the Hills is dedicated to promoting ALL creative art forms and traditions in Northumberland County, including the performing and visual arts, media, design and the literary arts. The event submission form below is the fastest way to get your event listed, however if you have problems with the form, please contact our webmaster John Charlton at webmaster@spiritofthehills.org with details and he will add your event for you. Items added to the member news page will also be included in our next newsletter unless the event has already passed when the next newsletter is published. Events submitted here will appear as soon as they are approved. Note: Allowed formats are jpg, jpeg, png, gif and pdf up to 3 Mb (3,145,728 Kb) in size.